Ariel (Hebrew: אֲרִיאֵל; Arabic: اريئيل‎) is an Israeli settlement organized as a city council in the central West Bank, part of the Israeli-occupied territories, approximately 20 kilometres (12 mi) east of the Green Line and 34 kilometres (21 mi) west of the Jordan border. Ariel was first established in 1978 and its population was 19,626 in 2017, composed of veteran and young Israelis, English-speaking immigrants, and immigrants from the Former Soviet Union, with an additional influx of 10,000 students. It is the fourth largest Jewish settlement in the West Bank, after Modi'in Illit, Beitar Illit, and Ma'ale Adumim. Ariel's jurisdiction spans 14,677 dunams (14.677 km2; 5.667 sq mi), and borders the Palestinian towns and villages Salfit, Marda and Iskaka. According to B'Tselem, within Ariel's municipal area there are several enclaves of privately owned Palestinian land, whose owners are not allowed access to them. Ariel (pronounced Ari'el), literally means 'Lion of God'. "Ari" (Lion) in Hebrew is also a synonym for bravery and courage and it is also the symbol of the tribe of Judah. The city of Ariel is named after Jerusalem. Ariel in the Hebrew Bible is one of the names for Jerusalem and the Temple of Jerusalem (Isaiah 29:1-8). Ariel was founded in 1978 on land that was seized for military needs and on land that was declared state land, including cultivated farmland of Palestinian villages in the district and on rocky land the villagers used for grazing their flocks. At the beginning of 1978, a group of Israelis formed in order to create a settlement in the hills of the northern part of the West Bank made a formal request to the government to be given land to build a new community and were given three options by the army; the area near the 'lone tree' which would later become Barkan, the area which would later become Kfar Tapuach, and a hill near Kifl Hares that was known to the local Arabs as ' Jabel Mawat', the hill of death, because of inhospitable terrain. The leader of this group, Ron Nachman, chose the latter because of its strategic location on a possible Jordanian invasion route towards Israel's main population centre of Tel Aviv. In the spring of 1978, some of the group's men erected tents on the chosen hilltop, and in August 1978, a total of forty families came to live in the settlement. The original members of the group had gone through a screening process in order to put together a mix of skilled adults as well as young families that would be prepared psychologically to withstand starting a new settlement from scratch with little infrastructure and modern comforts. There were no paved roads or paths. Water was supplied periodically by a tanker truck. Electricity was provided by a generator since no electrical network existed in that area. Tents were replaced by prefabricated concrete blocks which served as living quarters, schools, and an infirmary. On September 1, 1978, the school year was officially opened. From 1978 to 1988, Ariel continued to develop, and established itself as the urban center for the nearby Jewish settlements. In 1980, the prefabricated homes were replaced with permanent housing. The College of Judea and Samaria, which would later become the Ariel University Center of Samaria, and eventually Ariel University, was founded in 1982. Three elementary schools, a community center, a sports hall, and a synagogue were built. In May 1982, Ariel was connected to the national power grid. During the mass immigration of Jews from Soviet Union that began in 1989 and continued throughout the 1990s, Ariel, which had a population of 8,000 in 1990, experienced a population boom. Unlike in Israel proper, apartments in Ariel were plentiful and cheap, which proved attractive to the immigrants. Some 6,000 Soviet immigrants moved to Ariel, almost doubling its population. In 2005, the residents of Netzarim, a former Israeli settlement in the Gaza Strip which had been evacuated, found temporary housing in the dormitories of the Ariel University Center of Samaria. At the beginning of the academic year, about one-third chose to settle permanently in Ariel, while the rest moved to Yevul. In 2007, the city began receiving immigrants from English-speaking countries such as the United States, United Kingdom, Canada, and South Africa in significant numbers. Nachman, a central figure in the Likud party, presided over Ariel from 1978 until his death in January 2013, at first as head of the local council and as mayor from 1985, when the settlement was officially recognized as a city. Both religious and secular Jews reside in Ariel. The city has sixteen synagogues. On 5 February 2018, an Israeli man was stabbed to death in a terror attack at a bus station at the entrance of Ariel. Ariel is situated between 17 kilometres (11 mi) and 22 kilometres (14 mi) east of the Green Line, and 34 kilometres (21 mi) west of the Jordan River, Jordan's western border. Ariel is adjacent to the Palestinian Authority town of Salfit and southwest of Nablus. It is approximately 30 kilometres (19 mi) east of Petah Tikva, and 42 kilometres (26 mi) east of Tel Aviv to which it is connected by the Highway 5 and 60 kilometres (37 mi) northwest of Jerusalem, to which it is connected by Highway 60. Ariel's jurisdiction spans 14,677 dunams (14.677 km2; 5.667 sq mi), and borders the Palestinian towns and villages Salfit, Marda and Iskaka. Ariel's municipal area contains several enclaves of privately owned Palestinian land, whose owners are not allowed access to them. The central water pumping station in Salfit has been polluted several times by overflow from the wastewater in Ariel. The city has several shopping centres and two industrial zones (divided into light and heavy industry), a library. In July 2008, Israel approved the construction of 27 new factories, which were expected to be completed by September 2009. Like other settlements in the Israeli-occupied territories, Ariel is considered illegal under international law, though Israel disputes this. A series of Israeli governments has insisted that Ariel be included within Israel's future borders under any future peace treaty. 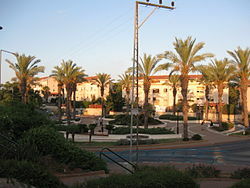 The Israeli Ministry of the Interior gave the municipality of Ariel the status of a city council in 1998. In January 2010, Prime Minister Benjamin Netanyahu, accompanied by leading figures in his governing coalition, declared Ariel the "capital of Samaria", and an integral part of Israel. In December 2010, thirty-five MKs petitioned the government to annex Ariel to Israel. Palestinian representatives have opposed the incorporation of Ariel into Israel in any future settlement, arguing that the Ariel 'finger' would interrupt the territorial integrity of a Palestinian state and includes a major aquifer. Ariel's future is thus not clear: "as well as an obstacle to an Israeli-Palestinian agreement, it could also serve as a crucial trade-off for negotiators hammering out a final deal." McDonald's Israel, the local subsidiary of the international fast food chain, turned down an offer to open a restaurant in Ariel in June 2013, citing its declared policy not to open any branches in West Bank settlements across the Green Line. Ariel is home to the Ariel University, founded in 1982 as the College of Judea of Samaria. It later became known as the Ariel University Center of Samaria. Current[when?] enrollment is 12,000, consisting of both Jewish and Arab students. On December 24, 2012, after many legal battles, the school became fully accredited and recognized as the 9th Israeli University. University status is an issue of prestige, increased government funding, as well as the ability to open post-graduate studies (which are already offered at the college) and issue doctorate degrees. Formerly called the 'Academic College of Judea and Samaria', it changed its name in August 2007 in the interim period and anticipation of achieving the more prestigious 'university' status. The state-funded Ariel Center for the Performing Arts opened on November 8, 2010, with a performance of Piaf by the Beersheba Theater company. These performances were boycotted by sixty Israeli actors, writers, and directors, including Joshua Sobol, who refuse to perform in settlements. Prime Minister Benjamin Netanyahu, Culture Minister Limor Livnat and the leader of the Kadima Party Tzipi Livni condemned the boycott and proposed cutting government funding those participating in it. The boycott was supported by Amos Oz, David Grossman and A. B. Yehoshua, It was opposed by Amnon Shamosh, who suggested that the boycott plays into the hands of right-wing extremists by linking art and politics. 150 U.S. actors supported the boycott. However, five Israeli actors later withdrew from the boycott, indicating that they changed their mind or thought the letter they were signing called for a discussion on the issue rather than outright boycott. The Israeli West Bank barrier was originally planned to extend out from the Israeli border to Ariel. Under American political pressure, the "finger", as the extension of the fence to include Ariel is often called, was not built. Instead, Ariel has a security fence surrounding it on only three sides. ^ "Table 3 - Population of Localities Numbering Above 2,000 Residents and Other Rural Population" (PDF). Israel Central Bureau of Statistics. 2010-06-30. Archived (PDF) from the original on 21 November 2010. Retrieved 2010-10-30. ^ a b Lazaroff, Tovah (2010-01-29). "PM: Ariel is the 'capital of Samaria'". The Jerusalem Post. Retrieved 16 October 2010. ^ a b "Local Authorities in Israel 2005, Publication #1295 - Municipality Profiles - Ariel" (PDF) (in Hebrew). Israel Central Bureau of Statistics. 2005. Retrieved 2008-10-03. ^ a b c d "Ariel settlement fact sheet". B'tselem. 17 July 2012 [30 August 2010]. Retrieved 15 March 2013. ^ Madmon, Yifat (2008). Ariel, sipura shel ir [Ariel, story of a city] (in Hebrew) (1st ed.). p. 20. ^ Levinson, Chaim (19 January 2013). "Ron Nachman, 'the last of the secular settlers,' who couldn't convince the Israeli public". Retrieved 15 March 2013. ^ Porat, Ido Ben (6 February 2018). "'My husband will not return to the community he loved so much'". Arutz Sheva. Retrieved 6 February 2018. ^ Lazaroff, Tovah (2008-07-14). "W. Bank city of Ariel gets OK for 27 new factories". The Jerusalem Post. Retrieved 2010-01-18. ^ a b Kershner, Isabel (2010-09-09). 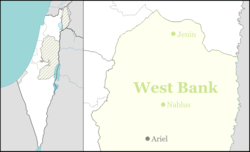 "A West Bank Enclave Is on Edge". New York Times. Retrieved 16 October 2010. ^ "Knesset members demand annexation of Ariel settlement" Archived October 7, 2011, at the Wayback Machine, The Palestine Telegraph, 4 December 2010. ^ Efrati, Ido (June 26, 2013). "McDonald's Israel refuses to open branch across Green Line". Haaretz. Retrieved 27 June 2013. ^ Levinson, Chaim (25 August 2010). "Major theaters raise curtain across Green Line". Haaretz. ^ Williams, Dan (29 August 2010). "Israeli actors boycott theatres in settlements". Reuters AlertNet. ^ Shamosh, Amnon (November 11, 2010). "Culture has no borders". ^ Miskin, Maayana (August 29, 2010). "Five Actors Withdraw from Ariel Boycott". ^ a b Hodorov, Irit (2008-09-26). "Gemini Sign". Yediot Petah Tikva. Yedioth Ahronoth. ^ "Mobile's Sister Cities". City of Mobile. Retrieved 2013-07-22. Wikivoyage has a travel guide for Ariel. Wikimedia Commons has media related to Ariel (city).